A feast for the senses in the historic Crown Room at seaside Hotel del Coronado. 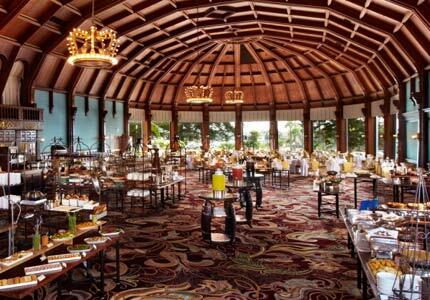 : Sunday brunch at the Hotel del Coronado’s Crown Room is a glamorous affair as guests feast in the iconic dining room. Whimsical crown-shaped chandeliers, designed by The Wizard of Oz author L. Frank Baum, hang from the high-domed, sugar-pine ceiling that was constructed without nails. The buffet itself is sprawling, with over seven action stations where white toque-wearing sous chefs delivering a bounty of food: eggs cooked to order; waffles with toppings like shaved coconut and pecans. The carving station features prime rib with truffle demi, legs of lamb and glazed ham. A display of salts from around the globe awaits to add a little flavor to the meats. The International section showcases the tastes of Baja, New Orleans and the wine country. Enjoy short ribs in sweet potato mash or ranch-style smoky beans. There are endless fresh salads and nice vegetarian dishes as well. Sushi and raw bar favorites fill another station, while charcuterie, an olive bar and freshly pressed panini represent the tastes of Italy. We suggest you leave room for sweets as the dessert section commands center stage with its chocolate fountain and every cake imaginable. Don't skip the handcrafted Bloody Marys with embellishments like horseradish cheese, bacon and asparagus. We appreciate the wealth of choices, skilled execution and old-school servers.